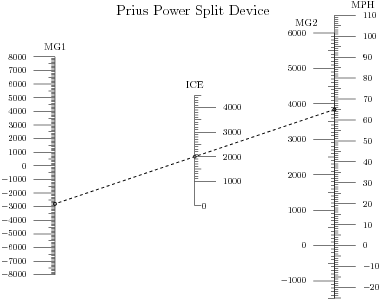 After finding a nomogram of how the Prius’s continuously variable transmission (or Power Split Device, in Toyota‐speak) works, I thought it would be a fun exercise to use PyNomo to create my own Prius PSD nomogram. 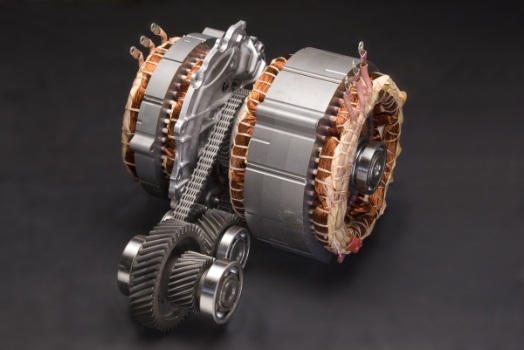 The PSD is a planetary gearset, with the sun gear attached to Motor‐Generator 1 (MG1), the planet carrier attached to the Internal Combustion Engine (ICE), and the ring gear attached to Motor‐Generator 2 (MG2). MG2 drives the front wheels directly. 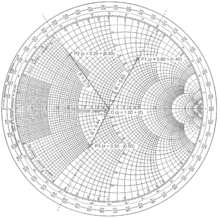 In the nomogram, the car is travelling 65 mph. Because this is a continuously variable transmission, there are infinite ways of achieving this road speed. MG2 must turn at about 3850 RPM because it drives the front wheels directly. However, the engine can be running at anywhere between idle speed and flat‐out. MG1 will then turn at a corresponding speed according to the relationship shown in the nomogram. 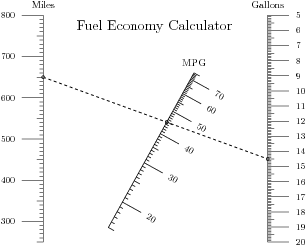 The nomogram also illustrates how the Prius can run in “EV mode,” where the car drives under electric power alone. With the ICE off, MG1 rotates backwards and MG2 rotates forward. As the car speeds up and slows down in EV mode, the isopleth line see‐saws up and down the MG1 and MG2 scales, anchored at the ICE’s 0 RPM point. Part of the elegance of the PSD is that there is no reverse gear. MG2 simply rotates backwards with the engine off. Cool! There is an interactive Flash‐based version on eahart.com.